How Soon Can We Expect the First Venom Trailer? 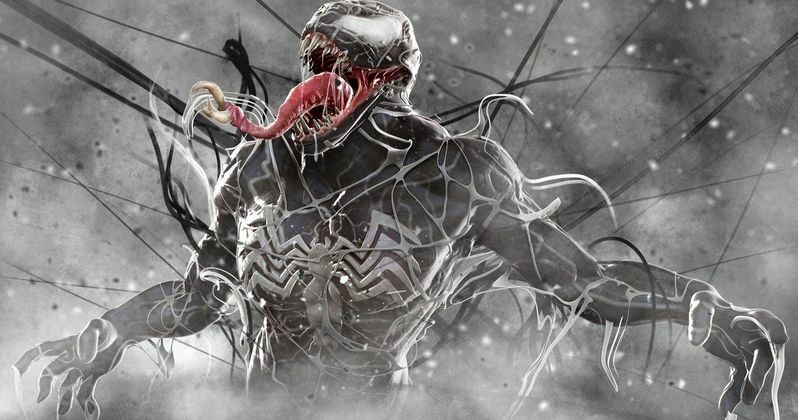 A new report suggests that we're going to be seeing the first footage of Venom a lot sooner than previously thought. Filming wrapped last week, according to a social media post from Tom Hardy and it appears that a trailer is being prepared for a release in the next 2 weeks. Though filming has wrapped, it appears that most of the heavy lifting for the movie will take place in the post-production process, which is reportedly happening now. It's been rumored that the first look at Venom may be shown in front of Marvel's Black Panther, which is only a few weeks away. The Manitoba Film Classification Board has officially rated the first trailer for the first Spider-Man spin-off, Venom, which means that it's coming soon. The trailer will be rated PG, which means nothing too crazy will be shown. However, it is pure speculation as to where and how it will premiere. The main rumors surrounding the teaser point to Black Panther, which if true, would make the trailers pretty stacked. The Deadpool 2 trailer is also expected to premiere on February 14th and then open in front of Black Panther. Additionally, Solo: A Star Wars Story is also heavily rumored to be shown before Black Panther as well. If all of the previously mentioned movies are to have trailers in front of Black Panther, it seems more than likely that we'll be getting a short teaser trailer with an official logo and maybe a look at Tom Hardy as Eddie Brock. Or, maybe we get our first look at Hardy as Venom. Either way, anything is a welcome surprise at this point, since fans have been clamoring for any official footage of the upcoming movie. It's just pretty surprising that something would show up this soon. Even though Venom has wrapped filming, there's still a lot about the movie that we don't know. Riz Ahmed was once thought to play Carnage, but it appears that he's playing Doctor Carlton Drake and Michelle Williams is playing Eddie Brock's ex-wife Anne Weying. Williams has been pretty tight-lipped about the prospect of seeing She-Venom on the big screen, which doesn't mean that it won't happen in the future or maybe even in the upcoming Venom movie. Carnage is still rumored to be in the movie, so it will be interesting to see how all of this pans out. We might even get a tease of the main villain in the next few weeks. And it's believed that Tom Holland as Peter Parker may even show up for a quick cameo. There we have it. The first trailer for Venom has already been rated and we should have our eyes on it really soon. Now all we have to do is play the waiting game, which shouldn't be too hard. In the meantime, fans can go back and re-read the Lethal Protector comic series, which the movie is based off of. You can check out the official rating for the Venom trailer via the Manitoba Film Classification Board.